October 30, 2017 at 11:49 am. There’s a new Heisman candidate in town. You might not have seen him yet. He is a sophomore. He has played extensively in only four games this season. He plays for Arizona, picked to finish last in the Pac-12 South. He usually plays late at night, East Coast time. All of his October games were on the Pac-12 Network, not the biggest megaphone in the broadcast world. That is going to change this week. 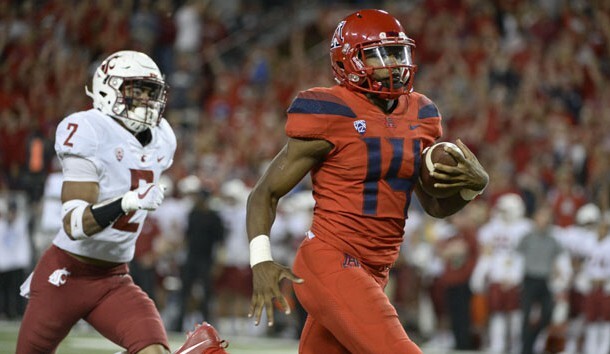 Arizona quarterback Khalil Tate — the West Coast’s Lamar Jackson — had another brilliant performance Saturday night as the Wildcats put a hurtin’ on No. 15 Washington State 58-37, passing for 275 yards, rushing for 146, accounting for three touchdowns and being the engine of a big-play machine. He has a chance to win his fourth consecutive Pac-12 Offensive Player of the Week award on Monday as the surprising Wildcats (6-2, 4-1 Pac-12) travel to USC (7-2, 5-1) with the South Division lead on the line. Tate and Arizona will have plenty of new attention this week as he goes back home to where he played for powerhouse Gardena Serra High School. He was a four-star recruit, an athlete taking snaps, but only Arizona coach Rich Rodriguez told him he could stay at quarterback in college. On Saturday night, Tate bolted for a season-best 82-yard run — his fourth game with a rush of 70-plus yards — and used Rodriguez’s zone-read offense with all those run-pass options to engineer seven plays of 40-plus yards for Arizona. Four of those long plays were via the pass, including two over the top, down the seam, to Nunley when Washington State had too many eyes in the backfield, spying on Tate’s legs. Get this: Tate ran for 840 yards in four October games on just 59 carries — that’s 14.2 yards per carry. He has touchdown runs of 58, 28, 47, 75, 45, 71, 76 and 49 yards. His 82-yard run was stopped at the 2 when replays showed his foot barely scraped out of bounds. Moreover, since coming in early against Colorado for an injured Brandon Dawkins on Oct. 7, he has completed 41 of 58 passes for 743 yards, with six touchdowns and two interceptions. It’s time for everybody to see it. Saturday’s game at USC will be another late-night affair — the game is in the 10:45 p.m. ET time slot — but it will be on ESPN, with the matchup being much discussed during the week as Arizona has become relevant. The spotlight will be shining on Tate all week. 1. Oklahoma State has a defense. The Cowboys gave up some yards and points at West Virginia — no crime in that — but came up with five takeaways, including four interceptions of Will Grier, in a 50-39 win Saturday. “I felt this was the best throwing quarterback that we have faced up to the point,” said OSU coach Mike Gundy. “It was turnover after turnover after turnover.” The Cowboys held Baylor and Texas to a combined 30 points in the previous two weeks. Not shabby. 2. The Heisman curse is real. Louisville quarterback Lamar Jackson is the eighth Heisman winner since 2003 to return to school, and none went on to finish better than third in the voting. Jackson won’t either. He’s still fabulous, leading the nation in total offense, but the Cardinals’ face-plant — including Saturday’s loss at Wake Forest — and no marquee games remaining will leave Jackson clutching just one stiff-armed trophy. 3. What took Jim Harbaugh so long? That’s the question among Michigan fans, as the coach finally had enough of quarterback John O’Korn and went with sophomore Brandon Peters, who quickly put together three consecutive scoring drives in a 35-14 win over Rutgers. “Like a bird leaving the nest. Kids leaving the house,” Harbaugh said. “It’s time.” With games against Wisconsin and Ohio State to finish the season, Peters could have a big say in how the playoff picture shakes out. 4. How about some love for Jon Heacock? Iowa State is one of the best stories of the season, and everybody is on coach Matt Campbell’s bandwagon. Don’t overlook the job being done by defensive coordinator Heacock, whose unit, since helping with the big upset at Oklahoma, has shut out Kansas, held Texas Tech to 13 points and kept the TCU offense out of the end zone Saturday in the team’s second win over a Top 5 team in October. 5. Get ready for the rankings. The College Football Playoff selection committee will release its first rankings on Tuesday night, but there’s no need to wait. Here’s how it will be: No. 1 Alabama; No. 2 Georgia; No. 3 Notre Dame; No. 4 Clemson. On deck: Oklahoma, Ohio State, Wisconsin. 1. 76 — Margin of victory for Georgia (83-7) in two games against SEC East rivals Tennessee and Florida. That the Bulldogs allowed only a combined 374 yards in those games says plenty about all three teams. 2. 15 — Consecutive games with a touchdown for Penn State Saquon Barkley, although none of those scores came in the second half against a storming-from-behind Ohio State. 3. 10 — Combined victories for high-profile first-year coaches at Florida Atlantic (Lane Kiffin, 5-2) and Florida International (Butch Davis, 5-3). FAU knocked off Conference USA bell-cow Western Kentucky on Saturday, staying on pace for an East division showdown in November with FIU. 5. 6 — Victories by Kentucky, making Mark Stoops’ team bowl-eligible for the second consecutive season. And, oh yeah, the six wins are as many as SEC East foes Tennessee and Florida have combined. 1. Oklahoma QB Baker Mayfield. By default, maybe? Mayfield threw for 281 yards and four touchdowns in Saturday’s win over Texas Tech, also rushing for a score. He’s still the national leader in passing efficiency. 2. Ohio State QB J.T. Barrett. What does a Heisman winner need? Heisman moments. Who got himself a Horseshoe full of Heisman moments in the fourth quarter against Penn State? This guy, of course. 3. Stanford RB Bryce Love. He sat out because of an ankle injury as the Cardinal barely survived a game at Oregon State, which further showed Love’s big-play value, because Stanford’s offense has nothing without him. With November games against Washington State, Washington and Notre Dame, that’s opportunity knocking for Love. 4. Penn State RB Saquon Barkley. His game-opening kick-return touchdown against Ohio State nearly put the Heisman in a headlock, but Penn State’s offensive line did little to help Barkley, who couldn’t shake free any which way in the second half. And just like that, Barkley — the national leader in all-purpose yards — is no longer the flavor of the week in the Heisman race. 5 (tie). Notre Dame RB Josh Adams and Arizona QB Khalil Tate. Perhaps it’s fitting they are joined together here. They each have four-game streaks with a run of at least 70 yards. 1. Oklahoma at Oklahoma State (Saturday, 4 p.m. ET) — This just might be Round 1 of Bedlam, with a potential rematch in the new Big 12 title game. The Sooners and Cowboys are two of the four teams at 4-1 in the league, with TCU and Iowa State being the others. 2. LSU at Alabama (Saturday, 8 p.m. ET) — The SEC has been boring, with Alabama and Georgia rising far above the rest in each division. But LSU has the goods to make things interesting for 60 minutes in what often is the best big-boy football matchup of the season. 3. Virginia Tech at Miami (Saturday, 8 p.m. ET) — All the Hurricanes do is win close games, four in a row by a touchdown or less. They will clinch the ACC Coastal Division with a win over the second-place Hokies, whose only loss was to Clemson. 4. Clemson at North Carolina State (Saturday, 3:30 p.m. ET) — Much will be decided in the ACC Atlantic, as the Wolfpack look to rebound after a loss at Notre Dame. Here comes another brutally physical matchup at the line of scrimmage for N.C. State. 5. Arizona at USC (Saturday, 10:45 p.m. ET) — Your college football nightcap features the best quarterback right now in the Pac-12, and it’s not Sam Darnold.